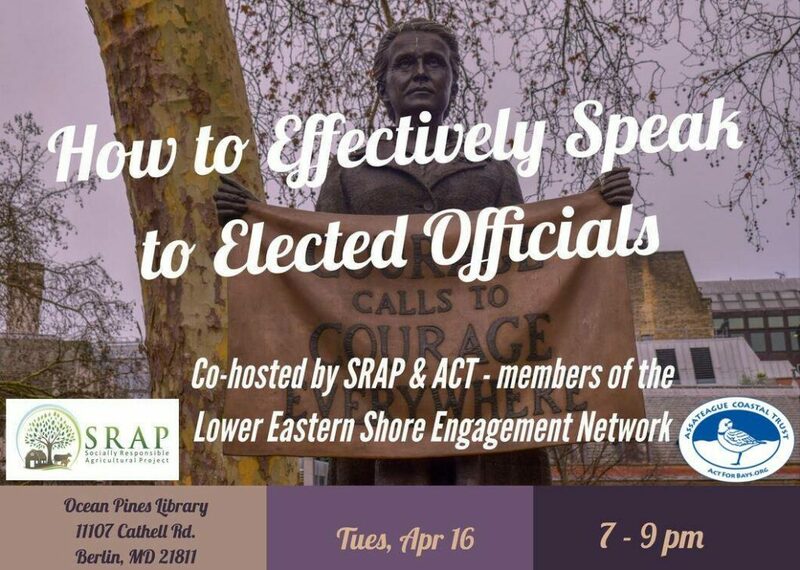 Join Assateague Coastal Trust (ACT) and Socially Responsible Agricultural Project (SRAP), members of the Lower Eastern Shore Engagement Network (LESEN), on Tuesday April 16th from 7- 9 at the Ocean Pines Library where we will discuss ways to get your elected officials to listen to you! This training is a video webinar with a community organizer and an experienced staffer who will teach us what works in effectively communicating with an elected official. After the video we will have experts in the room to answer your questions and offer in-person guidance. to environmental, community, and social issues and can be applied to any issue. You won’t want to miss it!